When calculating the Cashflow and Balance Sheet Forecast reports Calxa makes calculations using your P&L and Balance Sheet budget figures. Since this is the base of the calculations it is important to ensure that the budget used is balanced. Accounting rules dictate that debits must equal credits and the same can be said for your budget. 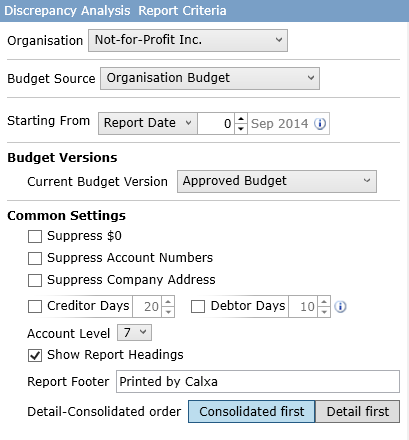 Calxa will use your Default Accounts and Cashflow settings to keep most P&L budgets in balance. For more complex budget scenarios it is possible that the budget will become out of balance. Specifically, this can occur when using a cashflow type of None or Schedule. For more information on these settings refer to support note – Preparing a Cashflow Forecast. The Discrepancy Analysis report can be used to check for budget balancing discrepancies and to isolate problem budget accounts. Access the report list by clicking on the Reports button. 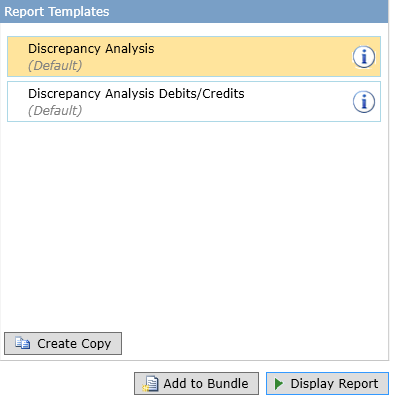 Select the Discrepancy Analysis report under the Forecast Reports header. Select the Organisation, Budget Source, Starting From period and Budget Version you wish to analyse. When you are satisfied with the report settings simply click on the Display Report button. We will use the example below to discuss the properties of the Discrepancy Analysis report. The before example shows some obvious discrepancies which have been resolved in the after example. As mentioned earlier discrepancies can occur when budgeting on accounts with a cashflow type of none or schedule. This is not the case for all accounts with these cashflow types and this is why the discrepancy report isolates only the accounts of interest, in particular the accounts with a cashflow type of none or schedule where they are not a calculated account. In the previous example you can see there is a discrepancy on the bottom line. If a budget is balanced then this value should be zero. This value is calculated by summing all of the debit values and subtracting all of the credit values. Accounts are grouped by cashflow type and then by account type. Grouping them by cashflow type allows you to first check that the correct cashflow type is assigned and clearly outlines why this account requires special consideration. It is for this reason that the accounts are not grouped by debits and credits. 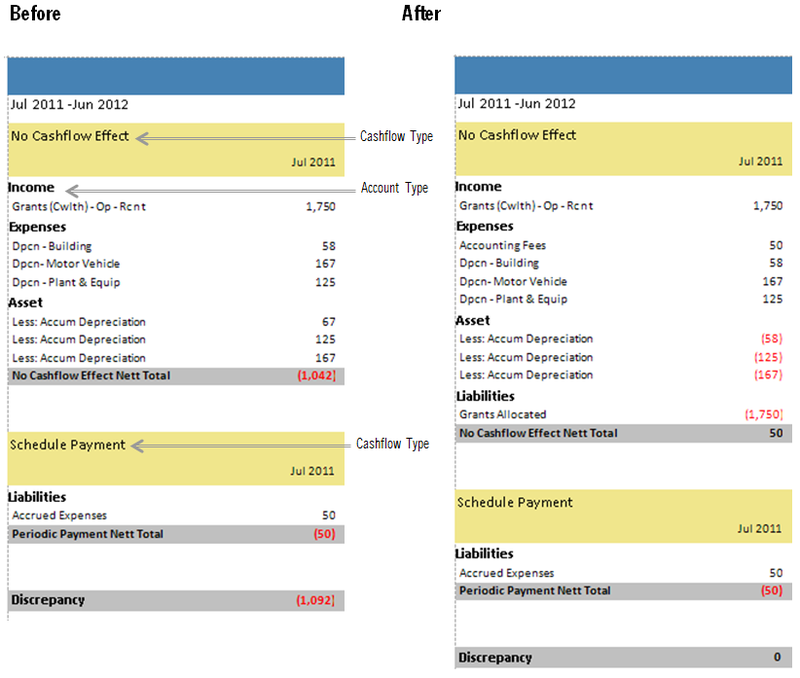 If discrepancies exist your first check should be that the correct cashflow types are assigned. Once you are sure the cashflow types are correct you should try to group the accounts into pairs or smaller groups that should individually have a balance of zero. In the example above let’s look at grants, depreciation and accrued expense as our smaller groups. The intention of our grant being set to none is because we have received the grants money in advance and the income budgets are used to journalise the monthly income. There is therefore no cashflow effect from this budget however in this example there is no budget to reflect the allocation of this income on the balance sheet. We will need to add a budget to allocate the income from the associated liability account. In the depreciation expense we can see that there are matching accumulated depreciation budgets, however a closer look reveals that they are out of balance for two reasons. The budgets should be negative as they are contra asset accounts and there is a variance on one depreciation account also. We will need to fix the asset budget lines to balance with the associated expense budgets. The accrued expense account has been set to a cashflow type of schedule. Is this correct? If it is correct then we need to ask which expense. There is no expense account to match this within this report. This is either because the matching account does not have a budget or the incorrect cashflow type is assigned. Accounts with a scheduled cashflow type require a matching account with a cashflow type of none. If we think of this example where the accrued expense will be accrued and paid quarterly then the payment each quarter will be balanced by the bank movement. The monthly accrual however needs a matching expense budget with a cashflow type of none.